Mission Statement: "My greatest desire is that the Lord takes this music to the masses. I don't like to think of myself and these songs as being in one box, for only one culture of people. I know that when we get to heaven there isn't going to be separate sections for Asians, Latinos, Caucasians, and African-Americans. We're all going to come together to worship. I hope this album will be a major step in that direction." On the back of his CD insert, the following positive scripture of encouragement and Cage's personal application of it sets the premise of his CD, which is love, trust, and worship the Lord and staying in His presence, depending on Him for the strength, power to sustain us no matter what the circumstances. Cage picked the scripture from Paul's letter, Galations 6:9: "Let us not grow weary in doing well. For in due season we will reap if we faint not." Waiting for God's time isn't easy, but Cage waited patiently and as you noticed above, doors were opened for his unique music ministry. His personal prayer of thanksgiving was also printed on his CD insert. "Thank you Lord for sustaining me during a very difficult seven years of waiting and isolation. I didn't understand in the natural, but thank you that in the spirit Your plan for my life was on course all along. God I love You more today. Even more than yesterday." 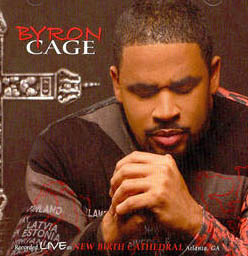 With this debut BYRON CAGE CD, this spiritually inspired, gifted music minister Byron Cage, supported by fine musical accompaniment and talented backup singers, including the accomplished Kurt Carr Choir, truly encourages the listener to rejoice in the Lord always, through remembering who He is and worship Him for His goodness, faithfulness, His enduring love and the hope we have in Him, despite the circumstances in our lives. Byron Cage' s fabulous producer, noted perfectionist Kurt Carr, through his own musical gifts, insight, and inspiration from the Holy Spirit, makes sure that the songs, some of which were composed by Carr himself, are performed at the highest level of musicianship. As the producer of this fine CD, Kurt Carr puts it all together, working along side with Byron Cage to give the listening audience a collection of Praise and Worship music that more than fulfills Byron Cage's music ministry goals. This uplifting CD not only offers an interesting variety of Praise and Worship contemporary Gospel music that appeals to people of all races, and all cultures, and all generations, but is also the perfect vehicle to pump up a person's resolve and faith in the Lord during good times, and bad times as well. These sometimes lively, sometimes reverent, spiritually uplifting Praise and Worship songs inspire a person's faith and hope in the Lord, in order to get out of the doldrums of discouragement when life gets rough with trials, pain, and difficulties. They take the focus off the individual and redirect the listener to our wonderful Lord, worthy of our praise, who loves us, upholds us, is merciful and faithful and will never leave us in our hour of need. Whether you are new to Praise and Worship Gospel music, or an experienced listener, this CD will be a blessing as it was to this reviewer, because it speaks to one's soul, and inspires a closer walk with the Lord through praise,worship and thanksgiving, making it the perfect cure for discouragement, negativity and self-pity. If you are down before listening to this CD, chances are you won't be after experiencing, soaking in the wonderful music on this CD, BYRON CAGE. The first two songs are wonderful, energetic praise songs which energize the Holy Spirit in the audience and performers, getting this Praise and Worship CD off to an uplifting start. Crisp, syncopated 1/2 step intervals, played by a cooking horn section, starts the introduction out with a bang. Light drums, guitar supports rhythm, soft organ chords support the main melody. Horns come back in at the chorus. Dynamics swell at appropriate times during the song. Full Gospel choir sound in nice harmonies back up the main vocals, sung with feeling by Byron, nicely. He is so worthy of all the praise. Oh come magnify Him, Jesus is His name. Honor and Glory belong to Him. Oh Come Magnify Him Jesus is His name. Bow down before Him lift up holy hands unto Him. *- First time -Byron sings alone. **2nd time: Choir chimes in too. Chorus: Come magnify Him. Jesus is His name. King of kings, Lord of Lords. Those who we worship and adore, Everybody praise Him. Come magnify Him. Jesus is His name Bless His name, Bless His name (We praise your name). Worthy Lamb, Worthy Lamb, Worthy Lamb of God. Worthy Lamb, worthy lamb, worthy Lamb of God. THE PRESENCE OF THE LORD IS HERE - Composed by Kurt Carr. Starts with simple piano chords, with vocals of Byron, sung solemnly. With each additional verse, organ, guitars play accents. Second time through with choir, drums take it up to a fast swing tempo, with piano, guitars, horns, and organ, joining in with a lot of energy. Byron leads by saying the phrase before the choir sings it. Interesting dotted note meter (swing feeling) and 1/2 step up in key change, between each verse, and at the coda. Song builds to a joyful conclusion. The presence of the Lord is here, The presence of the Lord is here. I can feel it in the atmosphere. The presence of the Lord is here, the presence of the Lord is here. The spirit of the Lord is here. The spirit of the Lord is here. I can feel it in the atmosphere. The spirit of the Lord is here. The spirit of the Lord is here. Chorus: Everybody blow the trumpet, and sound the alarm, Because the Lord is in the temple, let everybody know. Let all the people praise Him now. The Lord is here. The blessing of the Lord is here. * THOU ART A SHIELD FOR ME: PSALM 3 - by: Freda Tapp. Described as a "moving ballad of encouragement, and an offering of praise to God for His deliverance in times of trouble." A prayerful hymn of worship, supported by nice supportive piano, horns, strings, light drums, nice harmonies in the choir, and the sweet voice of Byron all brings the song to life. Nice dynamics throughout the song. Strings, light drums, touch of bongos, organ, guitar plays counter melody, all which supports the lovely melody of the vocals. The songs softens down at the coda to just the worship and prayer time lead by Cage, for a few measures. Byron Cage says, " In that particular Psalm, David is running from his son Absalom, who was trying to kill him. There's a very human side to all of us that cries out to the Lord in times of trouble and situations where we feel overwhelmed by life's circumstances. But in all we go through, we need to remember that the Lord is a shield for us, just as He was for David." 2) I cried unto the Lord with my voice, And He heard me out of His holy hill. I laid me down and I slept. I awakened for the Lord sustained me. Chorus: But Thou O Lord are a shield for me. My glory, You lift my head. But Thou o Lord art a shield for me. You're my glory, the lifter up of my head. I will not be afraid of ten thousands of people. That set themselves against me round about. I will not be afraid of ten thousands of people. That set themselves against me round about. * THERE IS A NAME - by Kurt Carr. - Described as "a deeply worshipful proclamation and glorification of the name of Jesus Christ." Another great worship song, with a beautiful melody, in piano, organ, strings. Great vocals by Byron and lovely harmonies in the choir. Has great dynamics that build and diminish with the song. Byron Cage says, "I think that song is destined to become a classic because it's a universal song of worship that crosses all lines of culture and ethnicity. It states the simple but powerful promises we can count on when we call upon Christ." Chorus 1: There is a name, There is a name, There is a name, There is a name, Precious name, Bless that Name. O Jesus there is a name. O Jesus there is a name. There's healing in the name, Healing in the name Healing in the name, Healing in the name, Precious name, Bless that name. O Jesus, there is a name, O Jesus there is a name. Chorus 2: Glory to that name. Glory to that name. Bless that name. O Jesus, there is a name, O Jesus there is a name. Coda: I'll forever praise that name. Jesus, Jesus, Jesus, Jesus. * GLORY SONG - By Byron Cage. Starts with a catchy, perky Latin rhythm, which is established by drums, piano in introduction. Piano plays a running counter melody which supports the main melody until chorus when organ and strings join in. Dynamics again increase throughout the songs. Crisp, precise vocals by chorus support the rhythm and the melody. Solo: From the rising sun, thank you Jesus. Group: I'm gonna lift You up. Solo: Until the sun is long gone, Group: I'm gonna lift You up. Solo: Oh Lord, You're worthy of the praise. Group: I'm gonna lift You up. Solo: And I think I'll praise You all my days. Group: I'm gonna lift You up. Special: Glory, Honor, Might, Power, Worthy, Jesus. I'm gonna lift You up. Chorus. YET PRAISE HIM - by Byron Cage - A praise song that really cooks! Drums, piano, guitars keep the rhythm driving forward. Melody carried by choir. Byron leads in the singing by saying the phrases first, but does join in, during some parts of the song. Lyrical Samples: Yet praise Him, Magnify the Lord! Yet praise Him, Magnify the Lord! Clap your hands all ye people. Shout unto the Lord with praise, sing unto the Lord, A new song. Shout unto the Lord with praise. Sing unto Him all the earth. Make a joyful sound and bless His holy name. Let the high praises of God be heard. Sing unto Him all the earth. Yet praise Him, Magnify the Lord, Yet praise Him, in trouble, We lift You up. I will bless the Lord at all times. Send Up the praises in His name. I will shout cause I have victory. How majestic is Thy name. Lift the praises, Loud up high. Satan, We have come to tear your kingdom down. SHABACH - Tobias Fox - Another victorious praise song that really moves with drums, piano and organ, with strings and horns playing embellishments. This song is sure to get you dancing around the room, forgetting your troubles as you praise the Lord along with Cage and choir!!! Chorus 1: Shabach hallelujah, Shabach, praise the Lord. Yadah extend your hand, Todah lift up your hands, Tehillah means to sing. Hallel means to celebrate, Kara means to dance, dance, dance, dance! The next three songs are beautifully done, and flow into one another, lifting up one's spirit in worship, in praise of the Lord, filling one with a peace and joy, helping one to forget one's trials and turn the focus on the Lord and what He has done for the individual. * THAT'S WHAT YOU ARE TO ME - by Kurt Carr A prayerful, worship song of praise and thanksgiving, which would be at home in any denominational worship service. Song has a beautiful introduction with a lovely melody using organ, and guitar. Piano, strings join in for the verses. Flowing melody carried by straight forward vocals, with traditional harmony. Byron Cage makes this a personal song of praise in the second verse, encouraging the audience to remember how the Lord has comforted them. 1) Lord, I love to call You Holy, for Holy is what You are to me. Lord, I love to call You Holy, for Holy is what you are, yes, Holy is what you are, Holy is what you are to me. 2) Lord, I love to call You Father. (When my father wasn't there, thank you that your loving arms embraced me. Come on, He's comforted you in your time) A Father is what You are to me. Lord, I love to call You Father. A Father is what You are, A Father is what You are, A Father is what You are to me. 3) Lord, I love to call You faithful. Faithful is what You are to me. Lord, I love to call You faithful. Faithful, Faithful, Faithful is what You are to me. Lord I love to sing Your praises, Praise is what You are to me. Lord I love to sing Your praises, For praise is what You are. Yes, praise is what You are. Praise is what You are to me. First time through, the women in the choir sing this lovely, full melody song of praise, with strong harmonies. Second time through the men and Byron Cage join in. Song builds in dynamics and then quiets down again. It is to You I give the glory, it is to You I give the praise. For You have done so much for me And I will bless Your holy name. It is to You holy Father, No one like You. And I will bless Your name, Bless Your name, Bless Your name And I will bless Your name, Forever more. This is the third worship-praise song in this series, that builds in dynamics and intensity until the finale. Has an easy rhythm, strong melody that flows over the listener, as the lyrics sink into your heart and lift your spirit in thanksgiving. Glory to Your name, Glory to Your name, Glory to Your name, Forever You are the same. We worship and adore You. We bow ourselves before You. Giving You the glory, that is due Your name. Vamp: We magnify Your name, Glorify Your name, Oh God. Thank you Jesus! A worship song sung like a mini-sermon, with a nice melody, soulful flavor, that builds in dynamics and intensity. Only the organ accompanies Byron Cage's heart-felt vocals in the spirit of the composition, full of feeling, in the style of a soulful, Gospel tune. Listen, As You climb the ladder of success, And the blessings come pouring in, Make sure, you're never too busy to praise Him. As He wakes you up everyday, don't forget to lift your hands up, and give Him praise. Make sure, you're never too busy to praise Him. You gotta trust Him in everything you do, And all these things will be added unto you. Make sure you're never too busy to praise Him. * STILL SAY YES - by Thomas Whitfield. Chorus: I still say yes, No matter what the test. I still say yes, No matter what the test, I still say yes, No matter what the test. Going on over, going on over, in His name, Moving by the power of Jesus name. Got to cross over By His blood, Gotta keep Satan, on the run. Gotta keep prayin', gotta keep saying Yes.